Swiggy, one of the top leading food ordering & delivery platforms in India, promises doorstep delivery in just 40 minutes. 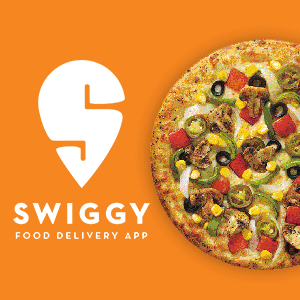 Swiggy began it's journey in the city of Bangalore and has now expanded to the entirety of the country. Order your wholesome meal of happiness with Swiggy and get extra cashback with Zingoy. Swiggy does not help with missing cashback issues. No cashback is paid on coupon codes of any other cashback site or partner (such as Paytm, Bank coupon code etc.). Tracking Details: Swiggy supports tracking only on Desktop site. Now Use 100% Supercash Using MobiKwik on Swiggy Orders from 4pm - 11 pm only on 20 -21 April. No minimum order amount. Not applicable on Domino's outlets. Swiggy Ice Cream Cashback Offers: Order online wide selection of Ice cream flavors from popular restaurants in your area from Swiggy. Order your Ice Creams from top restaurants like Natural Ice Cream, Apsara, Amul, baskin Robbins, Tender Fresh, Kwality Walls, Gelato, etc at best price. Swiggy Axis Bank Coupons : Now Get 20% Instant Discount upto 75₹ on Order Above 300₹ when you pay using Axis Card. Offer is valid between 4 Pm - 11 Pm only. Not valid on Domino's outlets. Swiggy Amex Cards Coupons : Get 20% instant discount upto 150₹ on Orders Above 400₹ when you pay using American Express Cards. Offer is only applicable on Thursday. Valid 3 times per user. Not valid on Domino's outlets. Swiggy XL Cashback Promo Codes : Introducing Swiggy XL for all those big orders. Order now! Now Get Flat 20% Off on First Swiggy XL Order. Use code SXL to get 25% off (upto Rs.1000) on your first order. Limited period offer. Swiggy MasterCard Offer: Now Get Flat 20% off on first order using Mastercard Cards on Swiggy food order. Offer is only valid On First Order. Offer is only applicable for MasterCard payments. Swiggy Cashback: Get 50% off on your 1st Swiggy order. Max discount: Rs. 100. No minimum order value. Valid in all cities except Vizag & Indore. Valid on all payment methods except COD. 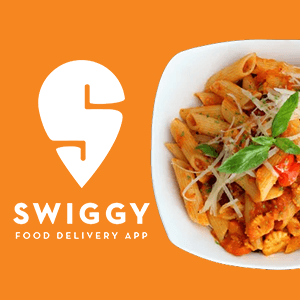 Swiggy New Users Cashback Coupons : Now get Flat 50% Off on First 5 Food Order. Offer is applicable 5 times per new users. Maximum discount of up to Rs.100 can be avail. Unlike other online food ordering platforms that only concentrate on giving buyers the widest variety, Swiggy not only gives you access to the food you need but also ensures that you get it as fast as possible. It has its own delivery personnel ready to ensure that you get whatever food you want in a matter of minutes after ordering and paying for it. Get the Swiggy app today and bring the best food, leading desserts, and restaurants to your doorstep. Every time your order food from Swiggy via Zingoy. It is the simple way to make your orders online along with the Swiggy offers you can also get amazing Swiggy cashback that will help you save money. Zingoy displays all the available Swiggy offers on this one page, and it also brings you extra Swiggy Cashback offers each time you shop your favorite food online through the Zingoy platform. Keeping checking for the updated Swiggy promo code to save more. Once you decide whatever you want to buy from Swiggy store, you can copy the specific link of the food products you want to buy and click “Get Link”. You can then go ahead to share it with your friends and family members through social media platforms. If any of them uses your link, you will earn amazing Swiggy Cashback on that too. Indeed, you have no reason to keep spending a lot when you can save your money through various means on Zingoy. 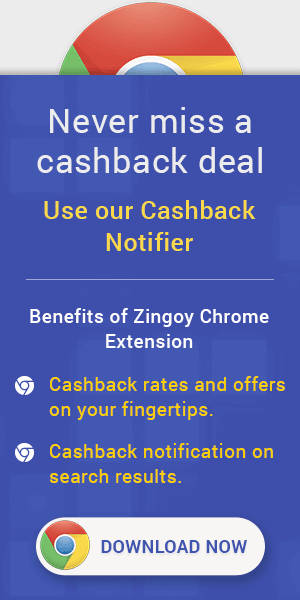 Remember that each time you shop via Zingoy, you earn great cashback over and above regular discounts. Save more on the popular restaurants like Subway, Behrouz Biryani, Faasos, McDonald's, Domino's, Ammi's Biryani, Yo China, Papa Johns Pizza, Pizza Hut, Rollmaal, Baskin Robbin, Box8 using coupons and promo code along with these extra Swiggy offers to get exclusive cashback through Zingoy. Swiggy has 3 payment options like wallets, COD and online payments. 20% off using your master card on Swiggy order.